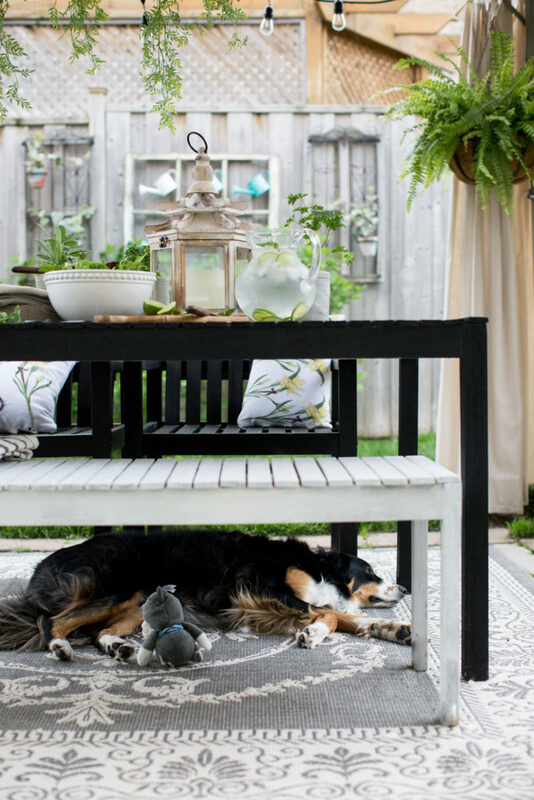 I’m sharing several ideas for outdoor living areas you’ll find inspiring. 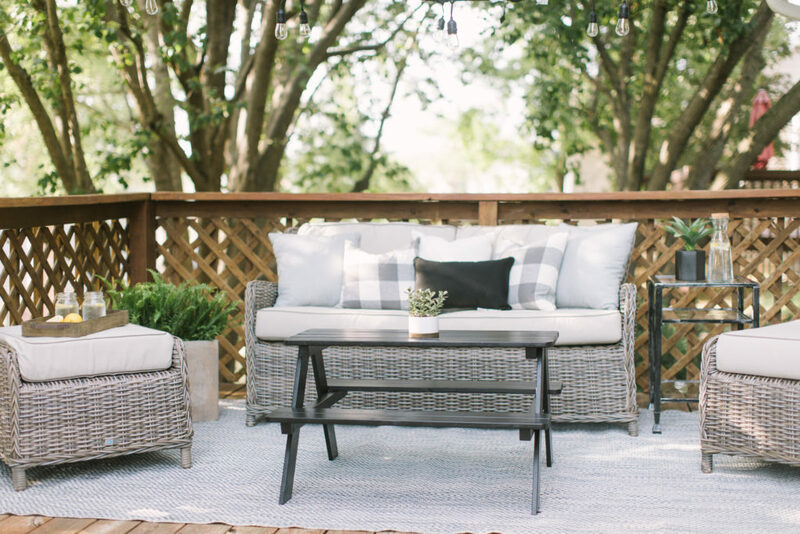 You guys know I’ve been busy in the background working on my own backyard makeover and updating my outdoor living areas the last few weeks. 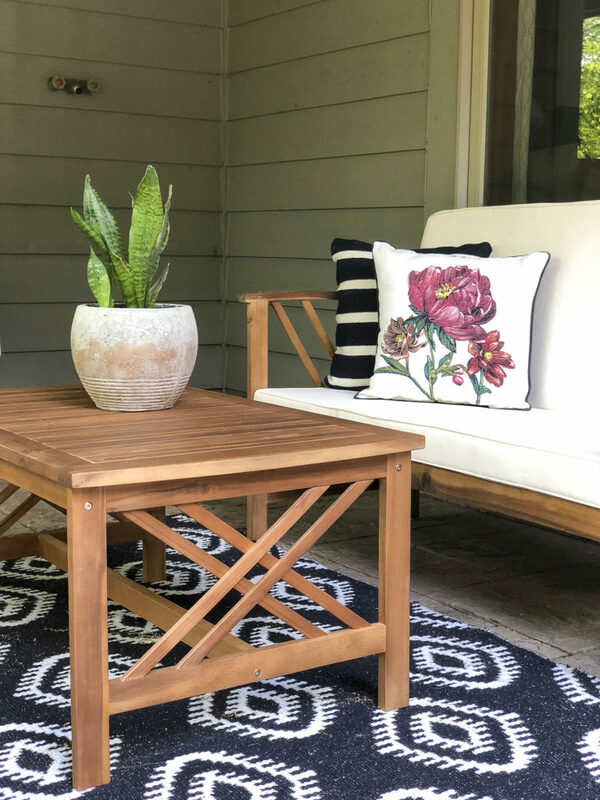 My goal is to makeover both my sofa seating and dining area to feel more cozy and inviting. I can’t wait for you to see what I’m doing to them! 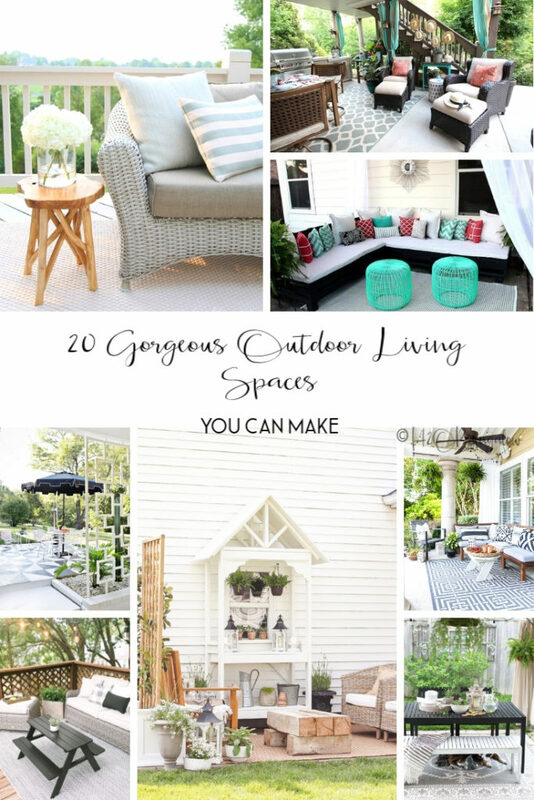 I found some great examples of outdoor living areas I thought were inspiring and wanted to share them today. 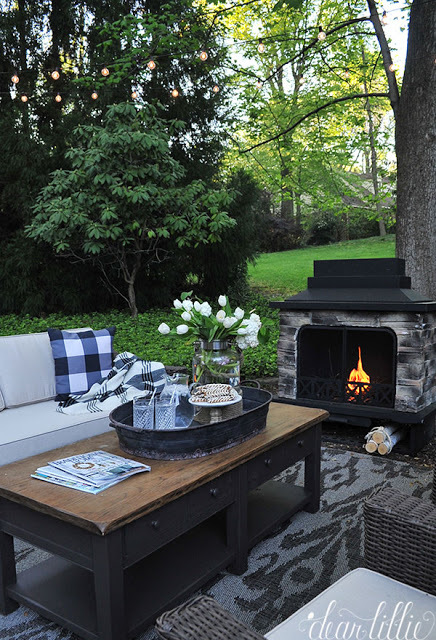 Outdoor living areas have become more popular in the last several years, and rightly so! 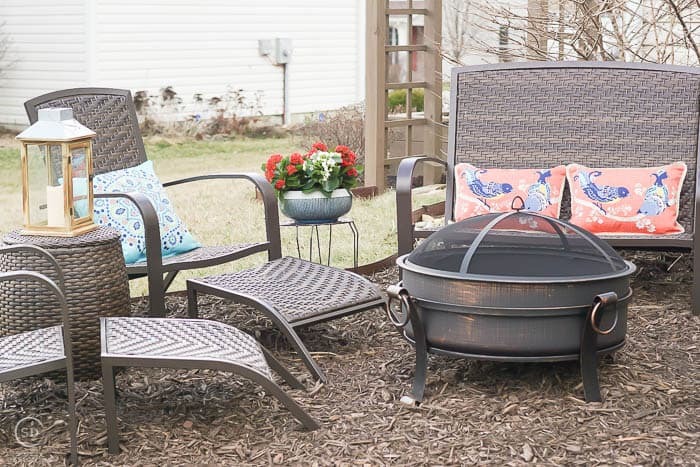 Creating an outdoor space to relax and unwind in is a great way to enjoy fresh air and take advantage of unused space. For small home dwellers like us this is especially so. Both our dining and living areas inside are really small. Our dining area is only 7 feet wide! 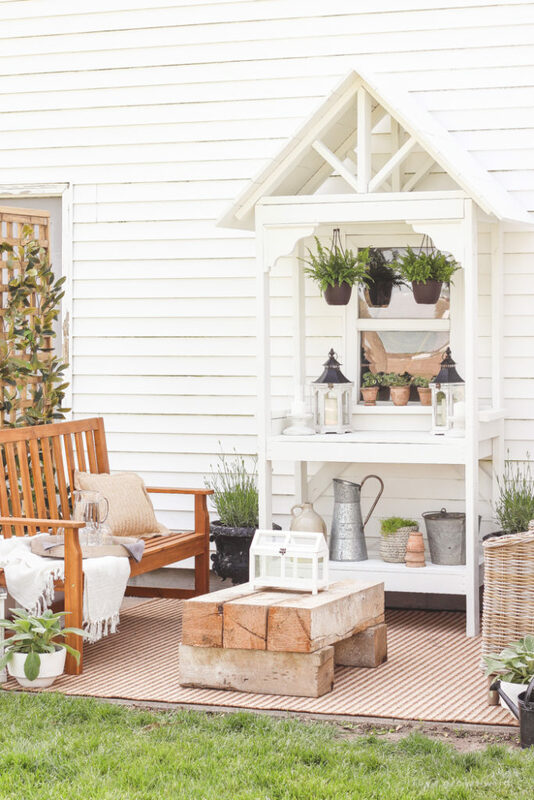 We have more room outside so it makes sense to find a way to make outside work as an additional room…or even two! 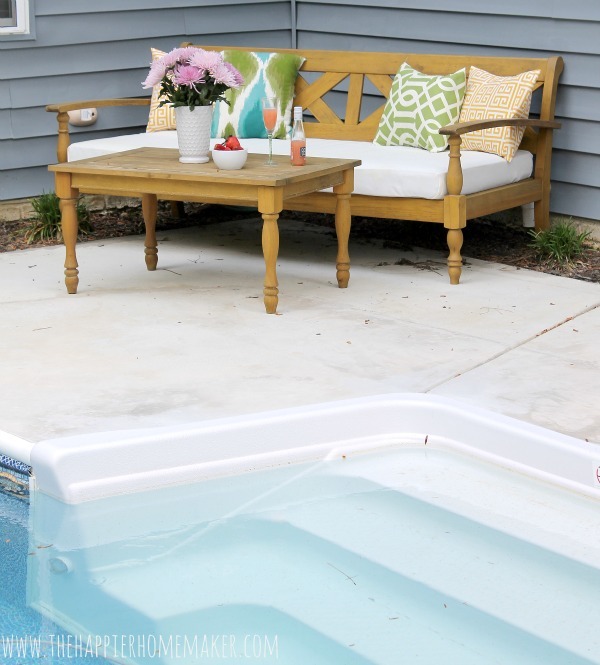 I’ll share my big plans for my Outdoor Overhaul and makeover in this Friday’s makeover update. If you missed my Outdoor Challenge announcement from last week start there. 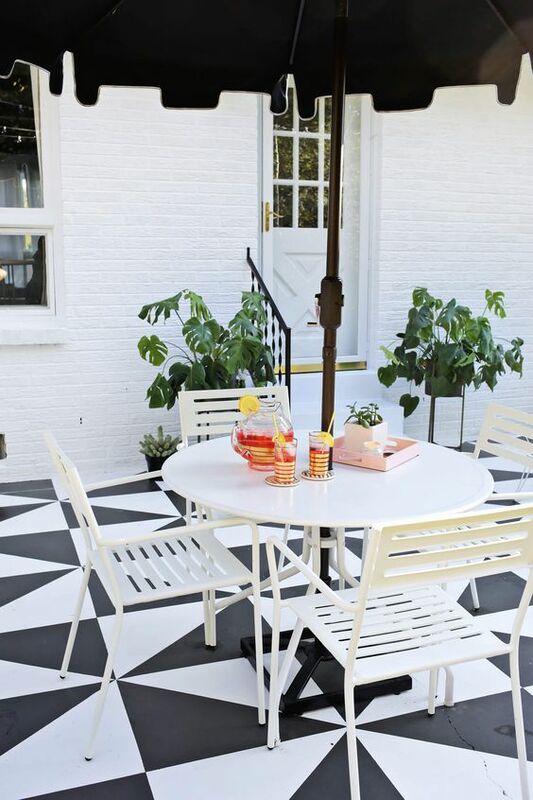 Outdoor dining areas are a favorite and so easy to decorate. They don’t need to be big or fancy. Just welcoming and comfortable enough for people to sit and stay awhile. I love the colors and living room feel of this combination dining and living area. Plus, she has plenty of shade which is a bonus! I love a comfortable outdoor sofa. 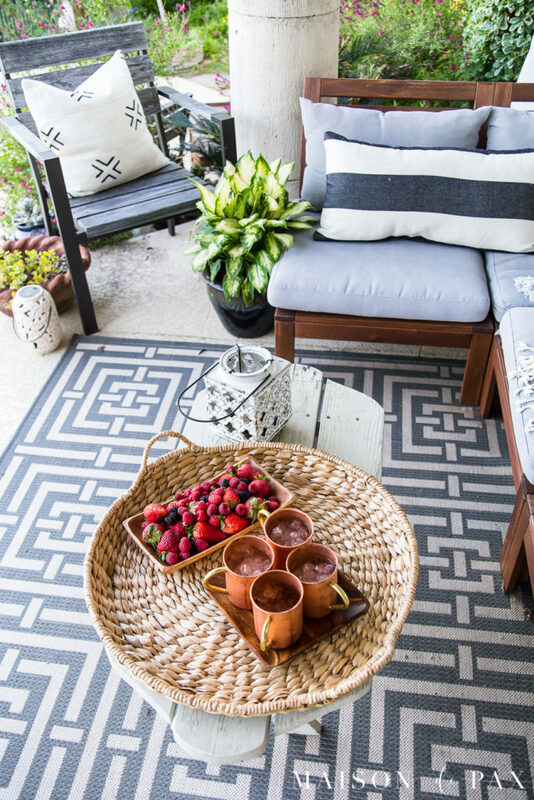 Add comfy cushions, a lap blanket for cool evening and a few extra throw pillows for a coordinated look. Build your own sofa like this Anna White design. 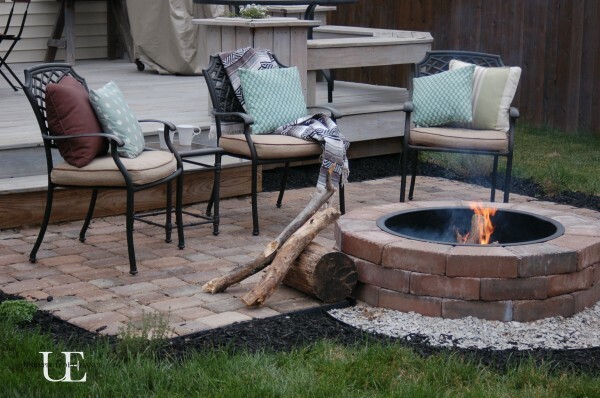 Who can resist an evening under the stars by the fire! 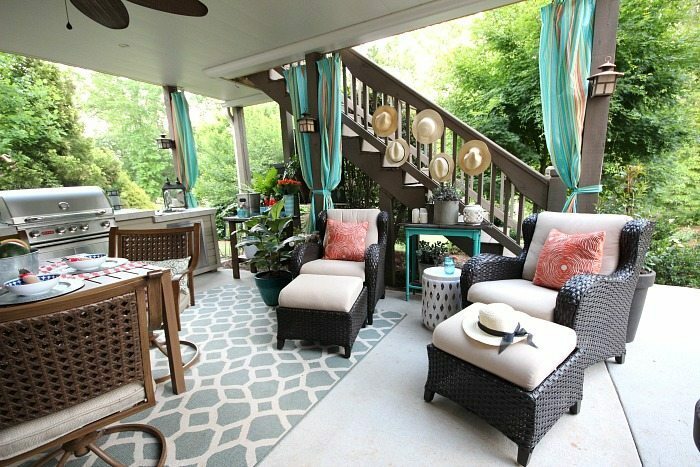 Decks are the perfect place to relax and enjoy nice weather, cozy up with a good book or to just take in a few moments of quiet time. I love this space! 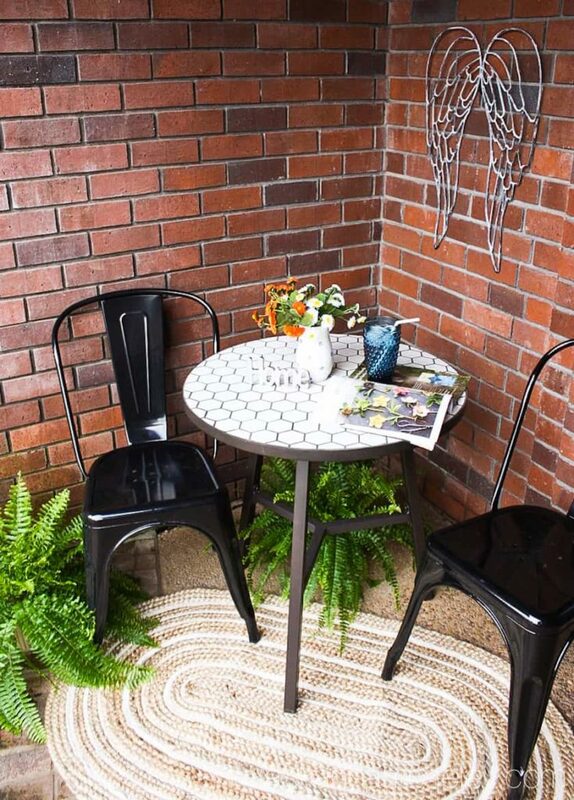 Here’s another picture of this inviting outdoor seating area. 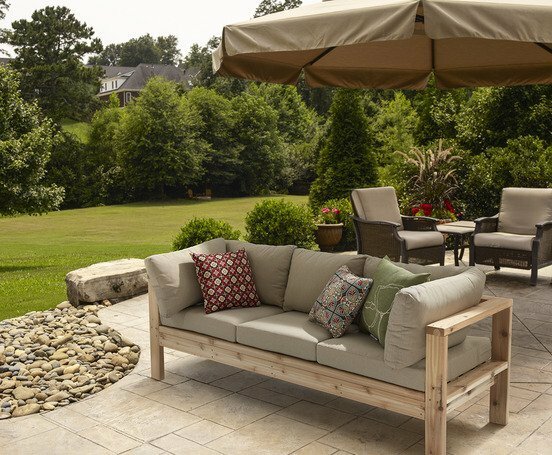 Outdoor Living Area by Julie Blanner Don’t you want to curl up with a cool glass of sweet tea in this space? 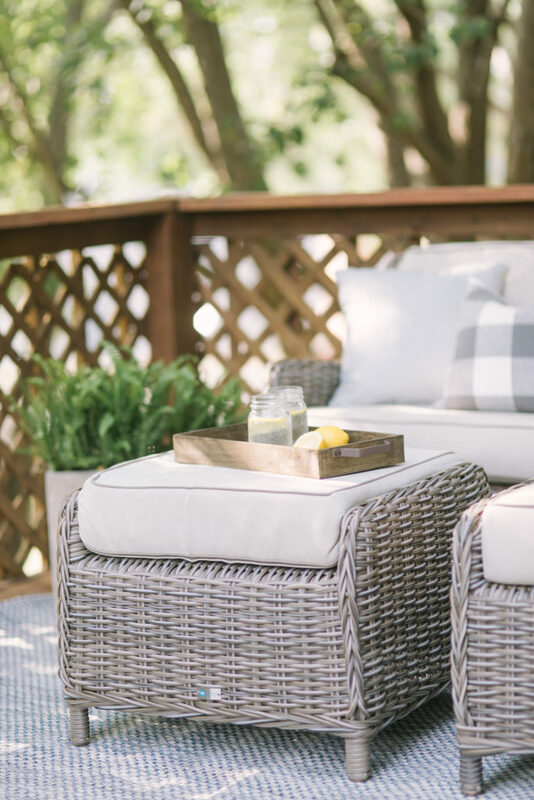 Porches make great outdoor living areas since they usually have good shade and a defined area. 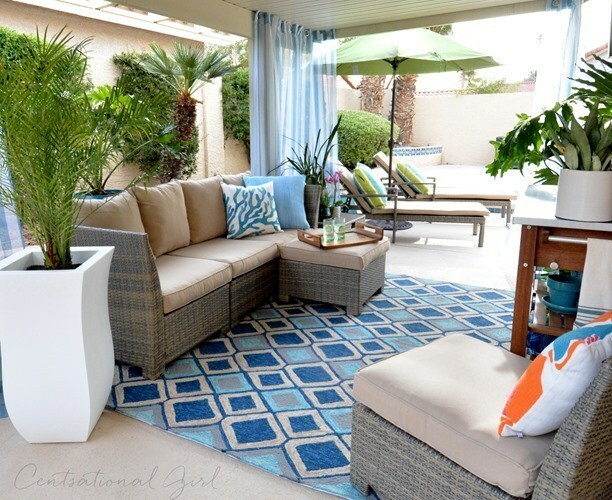 I love the way she defined this space with a rug and added lots of greenery. 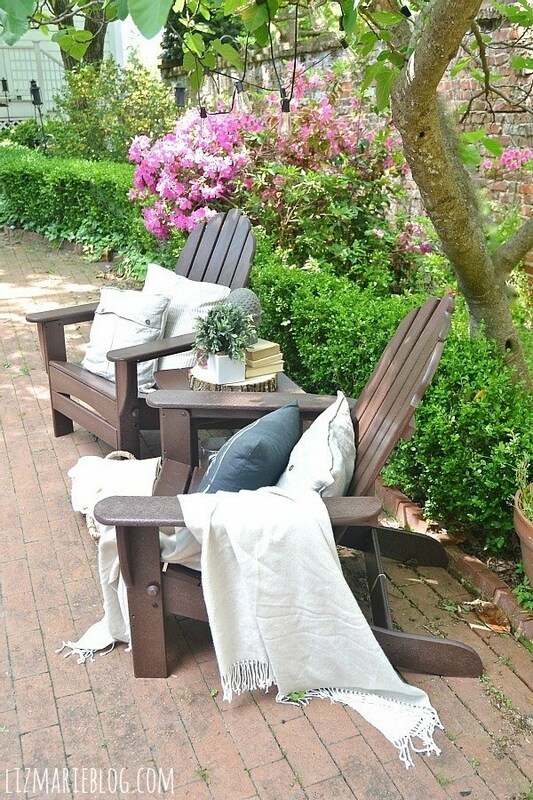 I can’t think of anything as cozy as a lush patio filled with greenery and a cozy place to sit and visit with a good friend. 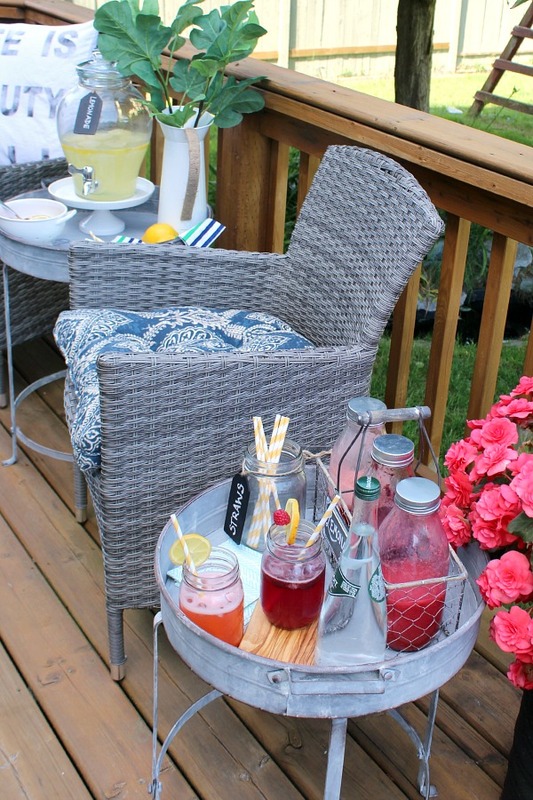 Outdoor Living Patio Makeover from angelaeast.com . 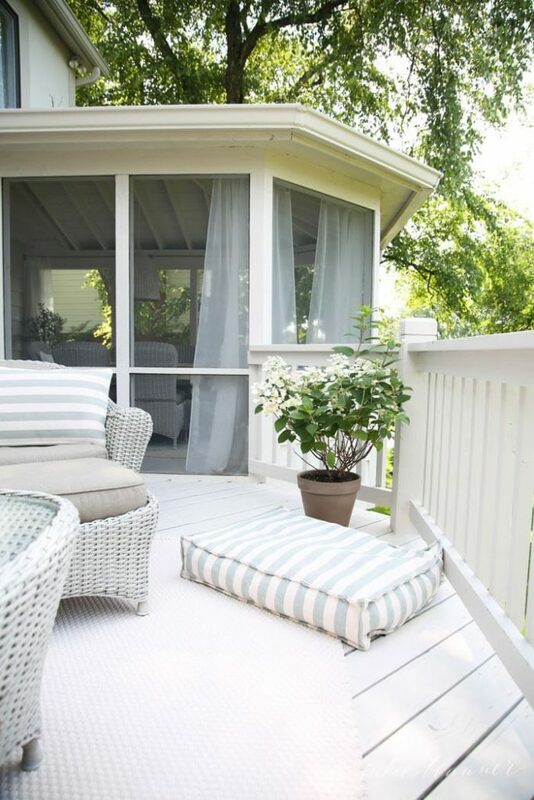 Outdoor curtains are always a winner and they are great for keeping the sun out! 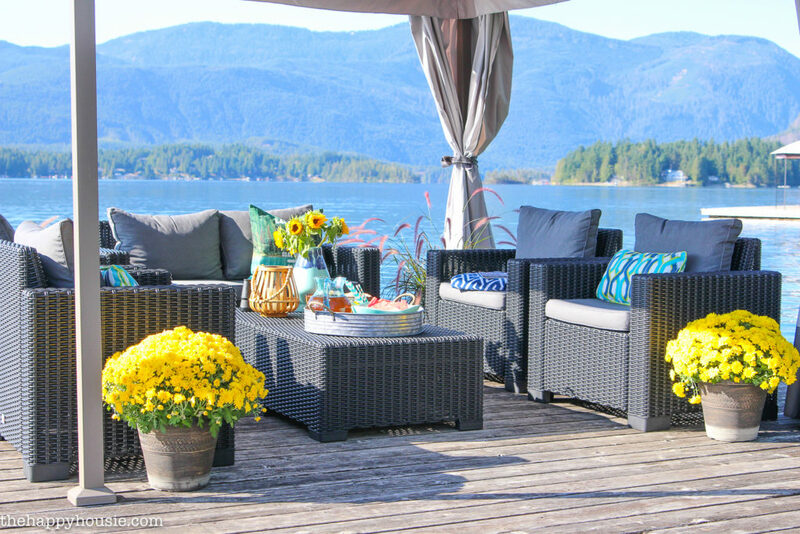 Last and possibly my favorite is the amazing seating and outdoor living area on a dock! Did you find any new ideas? Pin this to save for later and share with your friends on Facebook! Have I got you thinking about what you can do with your unused space? 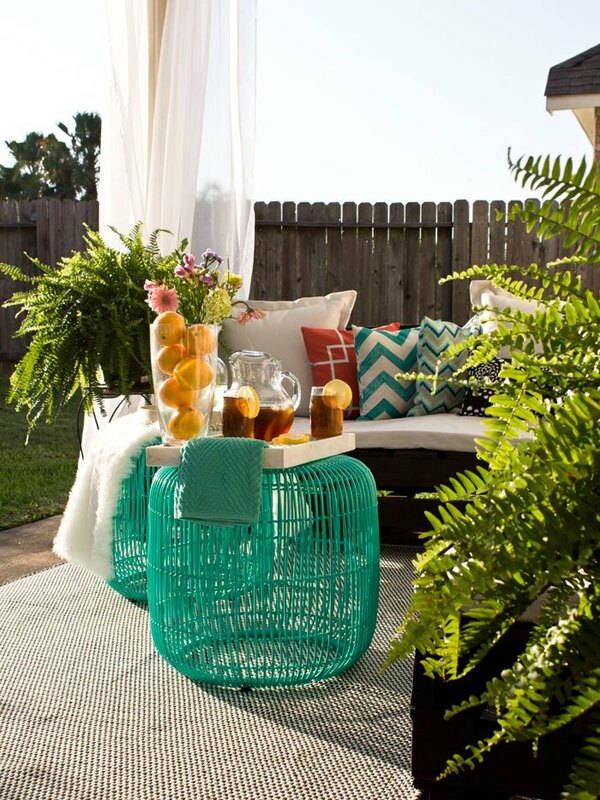 How about about updating your own outdoor living areas. 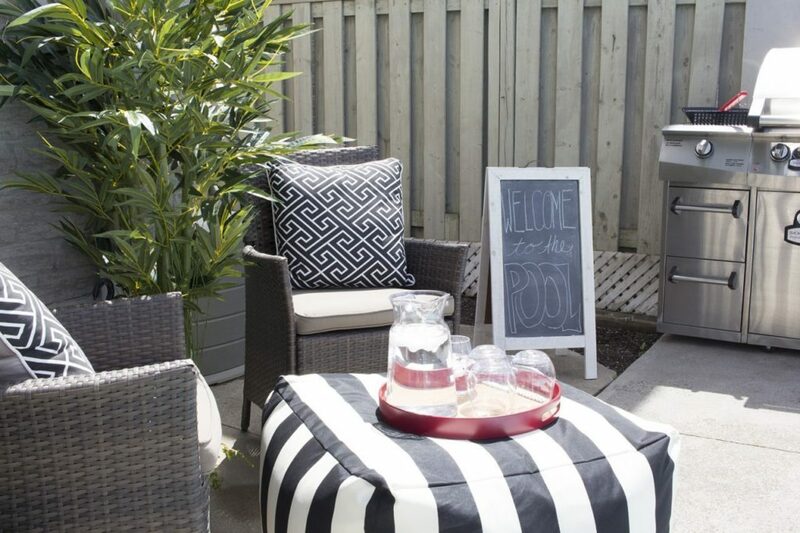 I’ve shared lots of great ideas and ways to use outdoor spaces around your home for additional living and enjoyment. I can’t wait to share my update this Friday!